It's the Rheo Thing: Can the Insanity Around the Plastic Recycling Codes Get Any Worse? 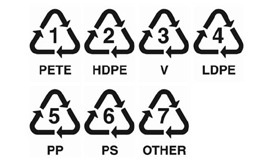 Can the Insanity Around the Plastic Recycling Codes Get Any Worse? I fear for the future of humanity whenever someone brings up the ASTM International recycling codes. That 7 little triangular symbols can cause so much anxiety and misunderstanding makes me question whether I should drive home tonight. There are about 7 different road signs in existence, so it just as likely that someone will treat a stop sign as a merge sign as it is that someone will think that the recycling symbols mean that the materials are biodegradable. Or that every time a plastic is recycled, the number put on it increases by one. Or any of a number of other confused ideas. But it's not just the general public that makes a mess of these symbols. There is also the ASTM International committee that keeps feeling a need to putz with the symbols. They've proposed adding more numbers in the past, but now they have outdone themselves. In their latest coup, they have decided to do away with the arrows and just make the symbols as solid triangles. Do they really think that people are going to 1) notice the change, and 2) change their thinking about recycling plastics? How many people are now going to think that the plastics CAN'T be recycled because the arrows are gone? What in the world is this change going to accomplish? Looking at the new designs, you can see with that the leading zero's under option B mean that they haven't given up on expanding the number of codes to 10 or more. The Devil finds work for idle hands! The purpose of an ASTM standard is to standardize test procedures, or performance levels, or as in this case, the descriptions of materials. I don't see how this committee thinks that "By replacing the arrows with a triangle, the code 'helps bring focus back to the systems core mission: resin identification and quality control prior to recycling',...". The resins are already identified by the numbers and the abbreviations underneath, and you can put dodecahedrons with flashing neon lights around the number and it won't change anything about how the resin is identified. It is the number and abbreviation that communicate, not the geometric symbol. And to make matters worse, there's a few legal matters that need to be addressed: "Changing the RIC [Resin Identification Code] is also hampered by state legislation — 37 states have laws that require the RIC in its original form to be used on plastic bottles or containers". 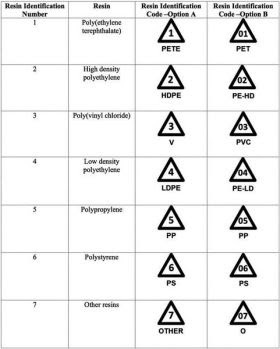 37 states have already embodied these symbols into their laws and now ASTM International thinks they can overlook that? What is it about these 7 little symbols that just causes such mindless insanity from all sides? Hanlon's Razor states "Never attribute to malice that which is adequately explained by stupidity", but this has all the makings of a massive conspiracy. One with no end in sight.